Set amid the distinctive beauty of the desert, Anantara Al Sahel Villa Resort is an elegant oasis effortlessly ensconced within the island’s rugged environment. From your private villa, catch rare glimpses of grazing gazelles and other island inhabitants. Unique amongst resorts in Abu Dhabi, we give you the chance to explore the savannah on nature and wildlife walks and marvel at views over the Gulf. Savour aperitifs infused with Arabian herbs, and spend evening hours unwinding in the warm waters of your private plunge pool beneath the stars. Nestled amid the waters of the Arabian Gulf, Sir BaniYas Island offers lavish comforts, splendid views and adventurous getaways. Anantara Al Sahel Villa Resort may be off the beaten path, but getting from anywhere in the world is easy either by boat, seaplane or through the luxury of a jet. This quintessential Arabian five-star resort offers a true glimpse of Middle East travel thanks to its glorious location on Sir Bani Yas Island, home to the Arabian Wildlife Park nature reserve off the coast of Abu Dhabi. 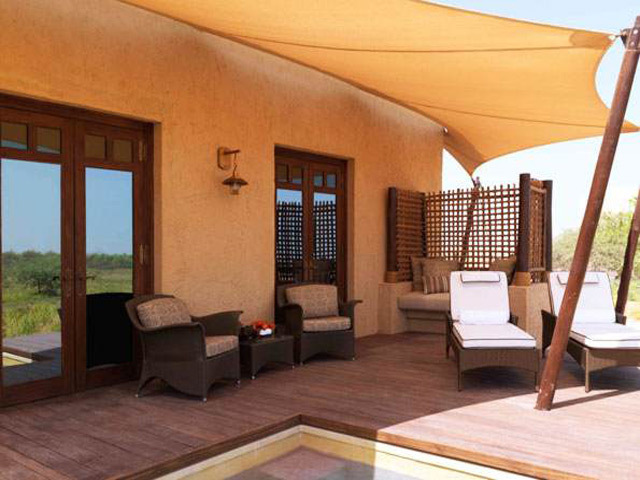 This all villa Sir Bani Yas Island resort sits amidst the Wildlife Park offering guests an incomparable glimpse of natural beauty and wildlife up close which combined with impeccable service makes for a breathtaking experience. A private lounge featuring international cigars to meet an aficionado’s heightened tastes. With a 460 person capacity, the standalone Conference Centre is equipped with breakout rooms, state-of-the-art technology as well as luxury indoor and outdoor meeting spaces ideal for conferences, weddings, meetings and large group events. An on-site prayer room provides guests with private space to practice religious rites. Stroll through the resort’s high-end retail outlet, offering designer goods and local handicrafts. Feel invigorated after morning laps or spend afternoons sipping cocktails on the deck. Float under a canopy of stars, the warm breeze and cool water complementing the day. Follow your routine any time during the day or night, or discover new programmes through sessions with our professional trainers. Stay fresh and energised with the latest fitness equipment featuring built-in technology, including a media hub for iPod, USB and TV channel selection. Spa Abu Dhabi style to the gentle lull of a desert breeze, the scents of myrrh and mandarin lingering in the air, the practiced fingers of the masseuse kneading away the tension in body and mind. A mere 10-minute drive to the north of the island, just outside Sir Bani Yas nature reserve, experience the unparalleled luxury Anantara Spa. Indulge in an assortment of invigorating rituals and modern-day spa treatments at Desert Islands Resort & Spa by Anantara for complete wellness of body, mind and soul or take advantage of Al Sahel Spa Villa just steps away for the ultimate in relaxing massage, by appointment at our Abu Dhabi luxury retreat. This signature dining venue feels like a luxurious safari lodge, matched by a culinary offering of western favourites and African specialties. Enjoy each morning a lavish breakfast buffet. Return for a light and classic lunch menu with a twist, and later afternoon tea with cake. Dine on the al fresco terrace by the light of bonfires in the evening, pairing rustic yet contemporary grilled dishes with recommendations by our Wine Guru. Enjoy a tapas style menu for lunch and dinner in a contemporary rustic setting beachside at the Water Sports Centre. Cosy, oversized chairs and sofas on the terrace create a relaxed living room feel, enhanced by lounge music. Cuisine celebrates vibrant world flavours and tempting land and sea ingredients. Savour daily specials, Arabic tasters and Asian plates, followed by signature homemade ice cream creations, while enjoying a breathtaking sea view. Escape to this tranquil Italian inspired restaurant and enjoy the tempting flavours of breakfast, lunch and dinner. Savour the inspiring, panoramic sea views with each mouth-watering treat, from fresh crisp salads to an array of main courses and exotic desserts. With the convenience of our pool par, there’s no need for guests to take a break from soaking up the sun. Al Shams offers plenty of lounge space complete with sunbeds for guests to enjoy a refreshing afternoon swim or snacks under shaded umbrellas. Light gourmet snacks and beverages in a casual, family-friendly atmosphere are served throughout the day, while Shisha in a range of soothing flavours provides the perfect Middle Eastern nightcap. Dining at Desert Islands Resort & Spa is defined by the casual outdoor elegance and zesty world flavours of Samak seafood restaurant. An abundance of seafood is prepared to taste on an open grill and accompanied by our impressive wine list. Breezy island evenings come to life with romantically lit poolside landscaping and culinary delights such as King Crabs sautéed in Oyster Mushroom Sauce. Start your day at The Palm, our restaurant that serves an international and Middle Eastern breakfast buffet. When dusk settles, the airy restaurant with its antique contemporary Arabic décor becomes the site for occasional themed nights. Each wine recommendation from our Wine Guru/expert harmonizes with the various dishes from our a la carte menu.